Cutting Room is a charming sharing plates restaurant and late-night cocktail bar on Charlotte Street which focuses on serving delectable little dishes lovingly crafted using well-sourced products that are as sustainable as they are seasonal. 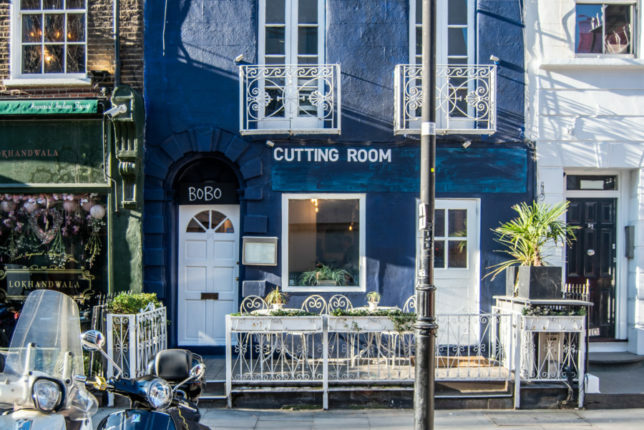 Cutting Room is a new concept born from the creators of Bobo Social and the shabby chic interior and mismatched nostalgic plates and cutlery add to the charm of this delightful restaurant. 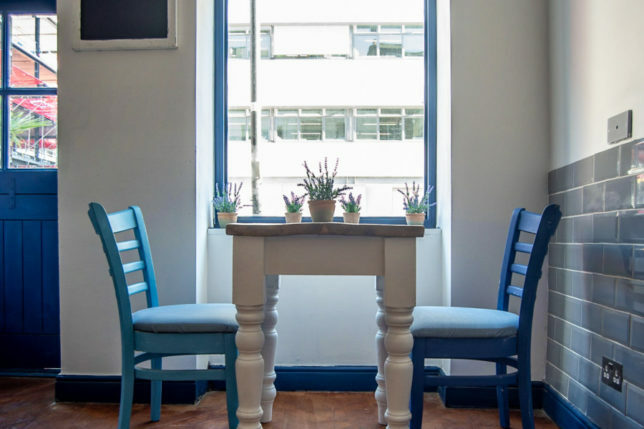 The passionate and hard-working team including their talented chef welcome guests to enjoy bespoke sharing plates with lovely cocktails alongside the freshest tunes from their resident DJ. As you would expect, recycling is a given but preventing recycling is also a focus of the restaurant. Hence, the Cutting Room does not serve bottled mineral water but instead offers purified filtered water. Spirits are purchased in reusable plastic bags to cleverly refill high-quality bottles. 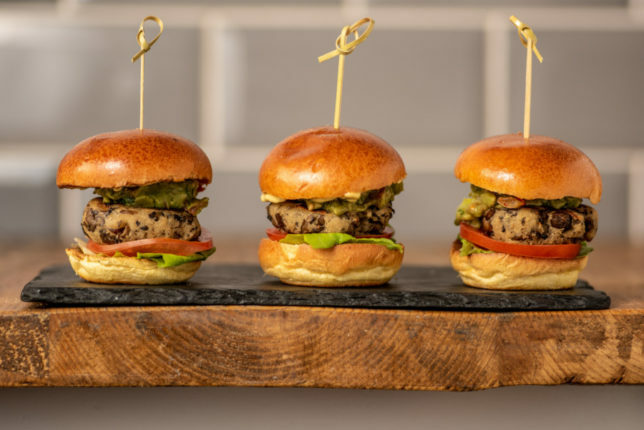 The Cutting Room works closely with a select group of suppliers ensuring short supply chains and control over the ingredients making their way into the kitchen. 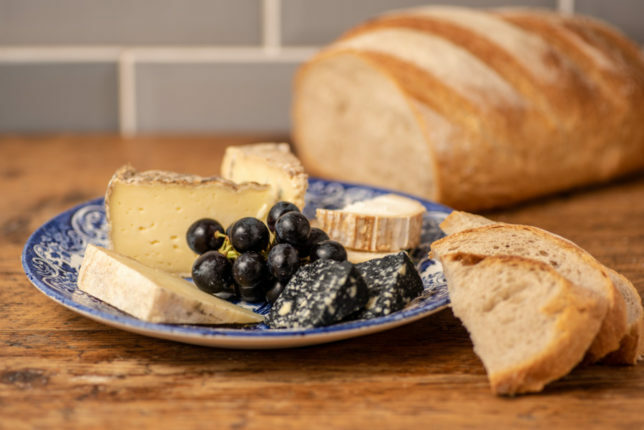 The ever-changing menu is led not just by seasonal ingredients but rather by the freshest produce that can change from one week to the next as supplied by the restaurant’s dedicated Fisherman (Marrfish), Butcher, Grocer (Mother Nature) and Cheesemonger (Carron Lodge). 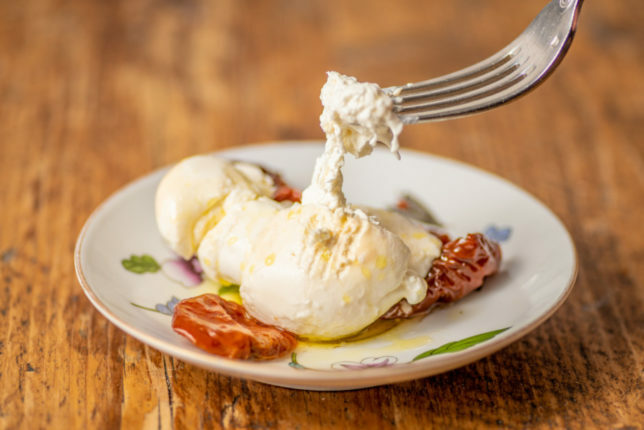 The menu is not the only thing that regularly changes at Cutting Room. 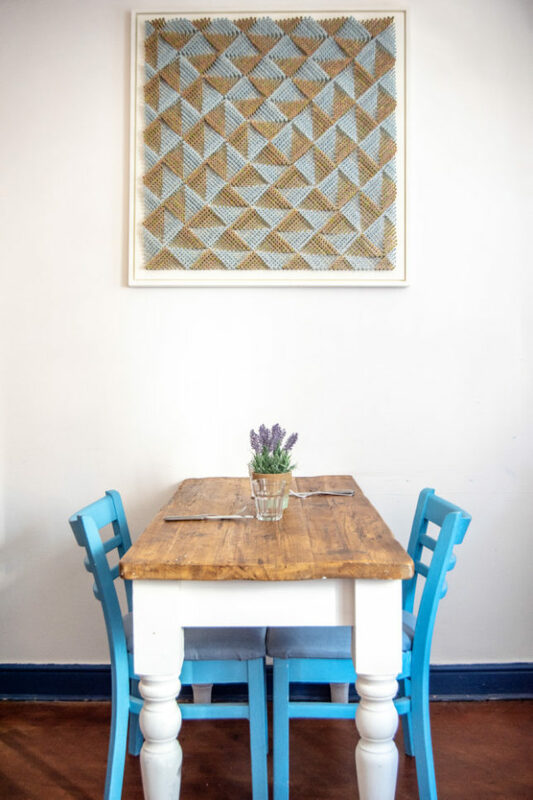 The decor also changes on a monthly basis, with contemporary art displays from the neighbouring Woolf Gallery gracing the walls. When we visited, the highly structured geometric artwork of Jack Tanner mesmerised the senses with their optical explorations of physical form and colour using re-purposed screws, spray paint and oils. 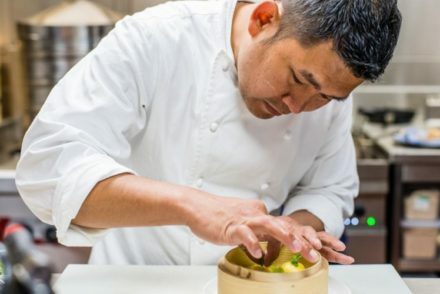 Focusing on sustainable and ethical ingredients, dishes on the menu are mainly cooked over charcoal using slow cooking methods, and the late-night downstairs bar serves bottle and barrel-aged cocktails. 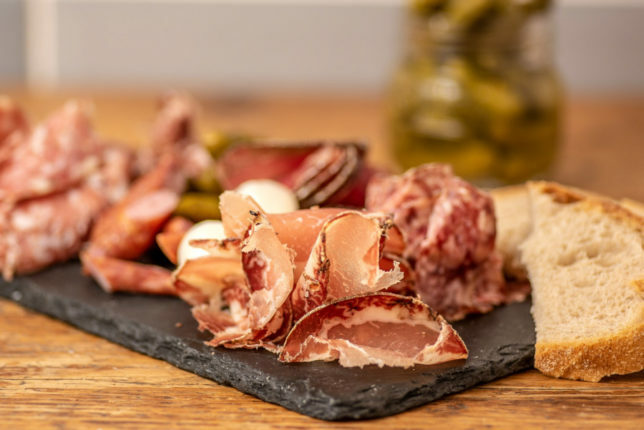 Made with thoughtfully-sourced produce, the meat section of the menu will feature charcuterie from Cobble Lane in Islington. Flock and Herd Butchers provide the meat for must-try dishes such as Braised Lamb Croquettes with Orange and Balsamic Reduction. Even those who are not fans of lamb will love these delectable delights. 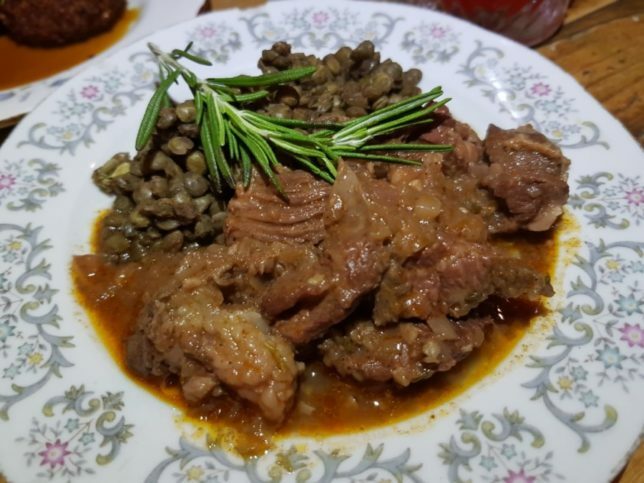 Another highlight on the Meat Menu is Mild Goat Curry Slow Cooked in Thyme, Rosemary with Lentils. The Caribbean influences of this dish are clear to see and we loved the accompaniment of the high protein lentils which added great texture and flavour to the dish. We also highly recommend the delicious Free Range Chicken Wings coated in a mouthwatering Sticky Bourbon Glaze. Chicken wings this good are a definite must-try as even this simple dish is executed with careful consideration by the wonderful chef and his team. Exotic Meat Balls change weekly but are always guaranteed to please if the Water Buffalo version we tried is anything to go by. 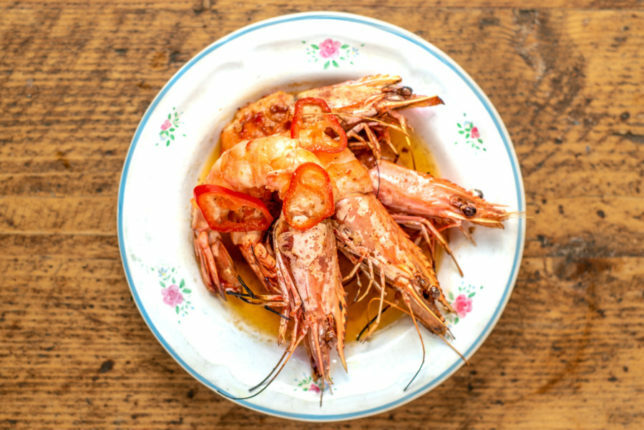 They had great texture – succulent and meaty – a real crowd pleaser! Marrfish catch and deliver the freshest fish to the Cutting Room kitchen with highlights on the Fish Menu including Crab & Shrimp Balls with a Dill Caper Mayo. This seafood dish was a real winner. 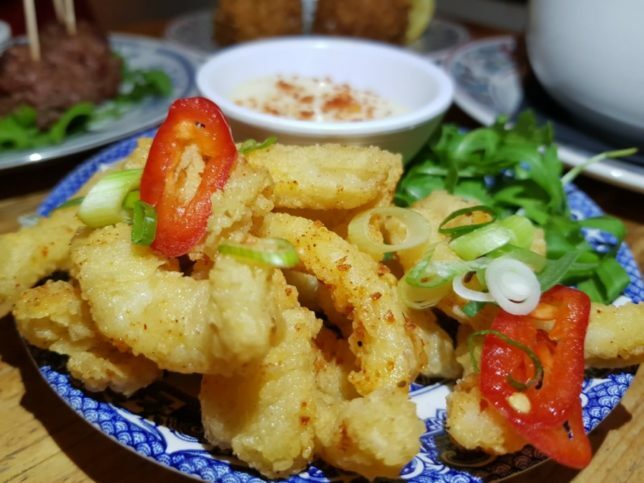 Also worth a special mention is the Crispy Fried Squid with Fresh Chilli & Spring Onion served with Lemon Aioli. This has to be one of our favourite squid dishes of the season! We loved the cutting technique used by the chef to create bitesize pieces of squid unlike the usual calamari rings but just as succulent… if not more so! Artichoke, Spinach and Parmesan Dip served with Rustic Bread is a big enough portion for two hungry chaps or three not-so-famished fellas. 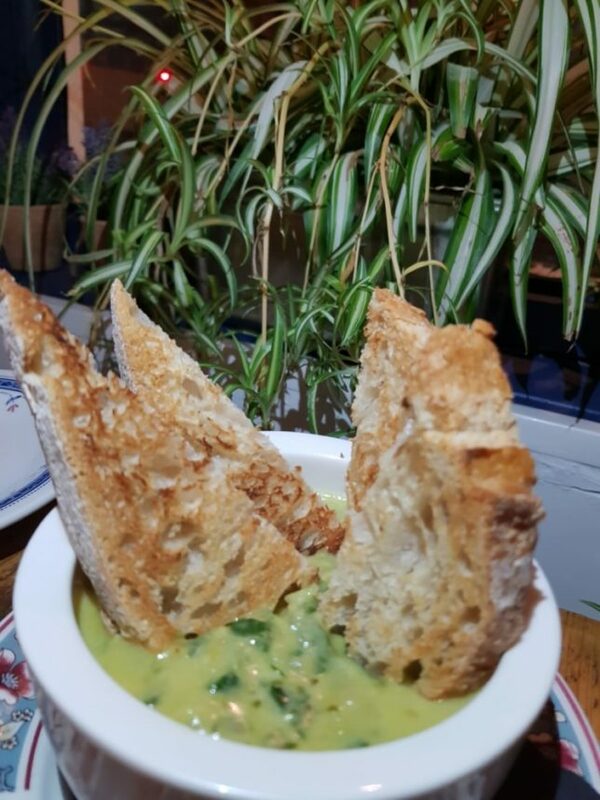 We felt that the texture was a little too runny being halfway between a dip and a soup but we loved the fabulous combination of flavours and weren’t surprised to hear that someone recently asked for a spoon to enjoy this dish straight from the bowl. A selection of dessert cocktails will be served alongside puddings including Apple Crumble in a Glass of apple and cinnamon infused Bourbon with vanilla, Amaretto, apple juice and crushed digestives and Death by Chocolate Martini of Creme De Cacao with Frangelico and vodka. 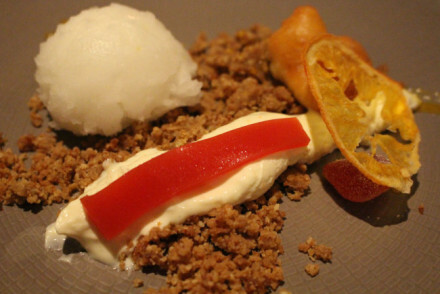 The dessert menu is comprised of only three choices. The Vegan Chocolate Mousse made with avocado sounds interesting as does the Brussels Waffle served with Nutella & Strawberries. Sadly the White Chocolate Cheesecake with Lemon & Ginger was off the menu on the night we visited and had been replaced by a Blueberry Cheesecake that was rich and creamy but a little cloying. 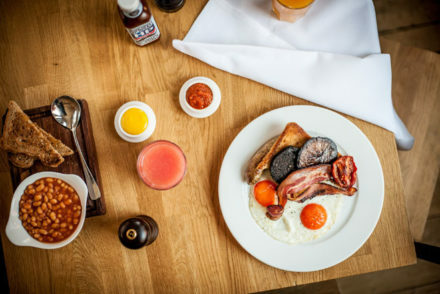 With late night DJ sets every Thursday, Friday and Saturday and contemporary art displays on the walls, Cutting Room manages to balance a trendy youthful vibe with honest flavoursome dishes that never fail to surprise and delight.